Our retreats are opportunities to take a break from our day-to-day lives to spend a day or two exploring a spiritual topic or learning a new skill. All of our retreats offer a spiritual component as well as opportunities for fellowship and sharing in a comfortable environment. Inward realities are often made known by the use of outward signs and symbols. For two millennia Christian artists have woven symbolic details throughout their masterpieces in order to convey theological truths, inspire the faithful, and educate the illiterate masses. Join us as we learn how to “read” Christian art in order to more deeply understand and appreciate our rich heritage and faith tradition, and as a means to encounter the Divine through contemplation. What is a Native (American) Indian? Do they still exist? 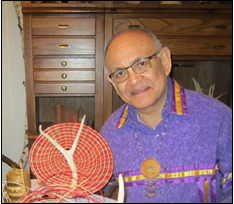 Come and learn from a Catholic member of the Haudenosaunee (Iroquois), Onyota^a:k(Oneida), and Latinyatha (Turtle Clan). Hear his Creation story and why he embraces both the Sacred Harmony and the Eucharist. Hear his family history, including forced enculturation and stories of survival. Through power point, personal photos, records, and documents, receive insights in our Brothers and Sisters in Christ! Please register if you plan to attend. All are welcome! In a world teetering on the edge of self-destruction, award-winning filmmaker Velcrow Ripper sets out on a unique pilgrimage. Visiting the ‘Ground Zeros’ of the planet, he asks if it’s possible to find hope in the darkest moments of human history. Ripper travels to the minefields of Cambodia; war-torn Afghanistan; the toxic wasteland of Bhopal; post 9/11 New York; Bosnia; Hiroshima; Israel and Palestine. This powerful documentary captures his five-year odyssey to discover if humanity can transform the ‘scared’ into the ‘sacred’. In each Ground Zero, he unearths unforgettable stories of survival, of ritual, resilience and recovery. We will watch the movie, then reflect and discuss to process what we have heard and learned. Join us for an evening of challenge, inspiration, and sharing dreams for a better world. How do you respond to unexpected developments in your life? So often we try to control our environment and forget to appreciate the beauty in God's plan for our lives. 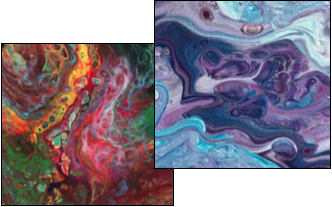 At this art retreat, we will explore the wonder of letting go and relinquishing control with acrylic paint pouring. As we experiment with colors and techniques participants will be encouraged to become aware of how they are feeling as the paint falls in unpredictable ways and will have an opportunity to reflect on their responses. Each participant will create two 10" x 10" canvases to take home with them. Sharing our stories is how we get to know each other. How do you tell your story? Do you listen to your own story? We are the stories we tell ourselves. What does the story you are telling say about you? Join us for a day of reflection and storytelling. Through sharing and listening, new perspectives of your story may emerge. You will be offered simple tools to empower you to step into your own story and to move toward the vision of your life. Members of a drum circle from Green Bay invite everyone to join the circle. Try out some of our drums or bring your own. Native flutes, ukuleles, singing bowls, and simple percussion instruments are also welcome. If you are shy about drumming, come, listen, and if you decide to, give it a try! No experiences necessary. All are welcome! Inside Out invites viewers, young and old, to take a look inside their own minds. Through the emotions of an 11-year-old girl, the film has some deep things to say about the nature of our emotions. You will laugh and cry as the inventive storytelling moves you through joy, sadness, anger, fear and disgust. Join us as we watch the movie then discuss its four main insights and reflect on the nature of our own emotions and how they affect our life. There are two major tasks in life: the first task is to build a strong “container” or identity; the second is to discover the contents that the container was meant to hold. In the first half of our lives, we establish our identities, build a home, settle into a career and begin our families. At some point, we begin to desire the deeper meaning underneath our identity, the Divine’s deepest desire for our lives. In this two-part workshop, we will explore the different halves of our lives and how they have and are shaping our lives today. As we explore our first tasks, Barb will help us “build” our own clay containers; then in our second session we will reflect on what will fill these containers as we glaze and put the final touches on the containers we created. Join us for this reflective, creative series. Crystal singing bowl meditation integrates the healing vibrational sound of crystal bowls with the transformative energy of crystals and stress reduction. It will calm your soul, balance your energy flow. The vibrations of sound can create a state of relaxation and tranquility deep within. They can also stir and release blocked energy, pain, anxiety and emotions and take you to a place of greater self-awareness. Come, join us and feel the presence of God. With One Voice brings together mystics from fourteen different spiritual traditions to share their perspectives on the unifying truth that transcends all religions. In this documentary, these awakened teachers address profound questions about life and love, the existence of God, the path to spiritual awakening, and the way to true peace in the world. Not only do they address life’s questions with eloquent, moving, and often humorous candor, but they offer answers… answers ancient and new, simple and complex, and always provocative. Through their words and compelling presence, they ask us to look within our own hearts and listen deeply, so we too can join the conversation and speak With One Voice. We will watch the documentary then reflect and discuss to process what we have heard and learned. Join us for an evening of challenge, inspiration, and sharing dreams for a better world.